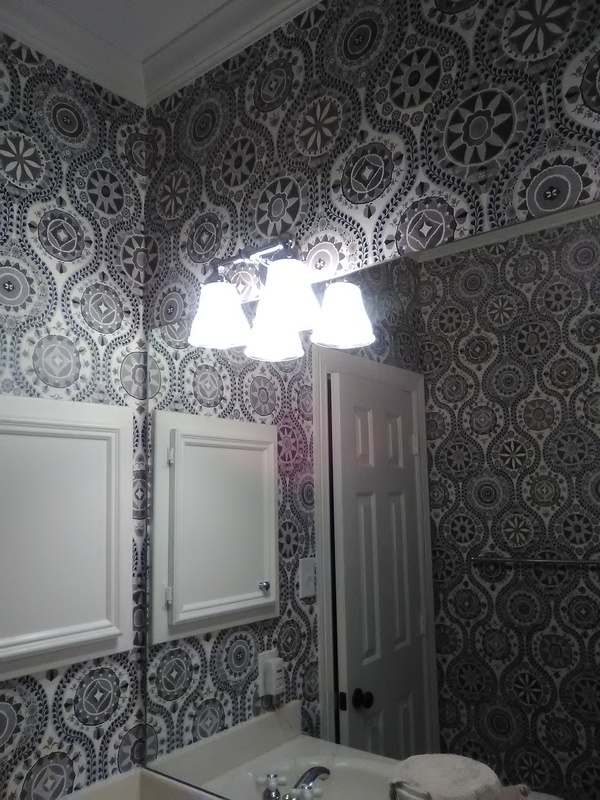 I hung this sunburst medallion wallpaper in an entry in west Meyerland a year or two ago. Originally, there was a doorway in the middle of this wall that led into the adjoining room. The homeowners had the doorway closed off, and the opening was replaced with a new piece of Sheetrock. This needed to be covered with wallpaper. 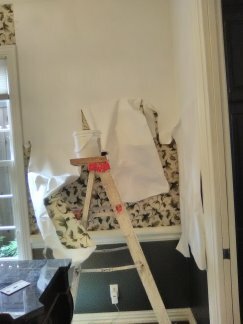 New wallpaper could not be patched in, and the damaged areas along the wainscoting could not be readhered, so new paper had to be bought to cover the entire wall – as well as a section over the entry door. The second and third photos show where the contractor had pulled the paper away from the wall. As you can see, it took some of the primer and the paint below it, too. 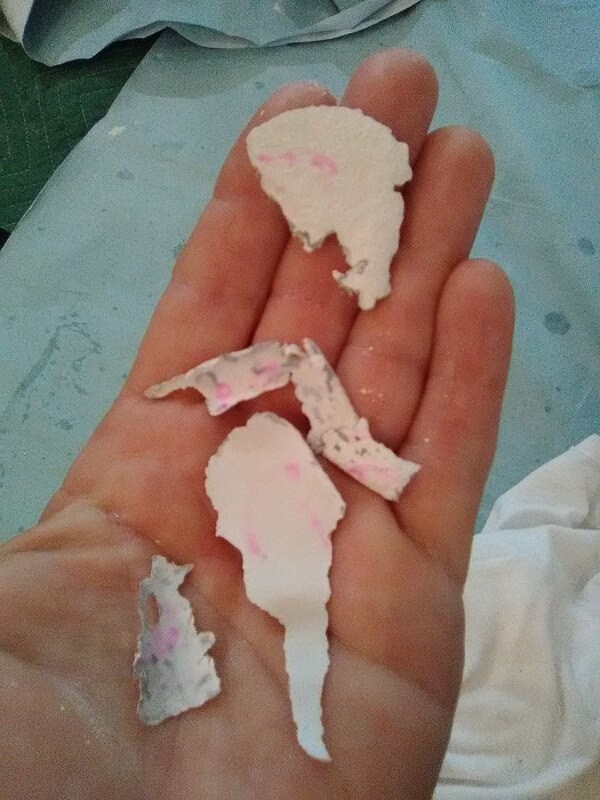 I wish I knew what the contractor did to have this result, because when I stripped off the rest of the wallpaper, it came off easily and left the wall surface below it perfectly intact. I suspect that he just yanked the paper, or possibly used heat or some weird chemical. 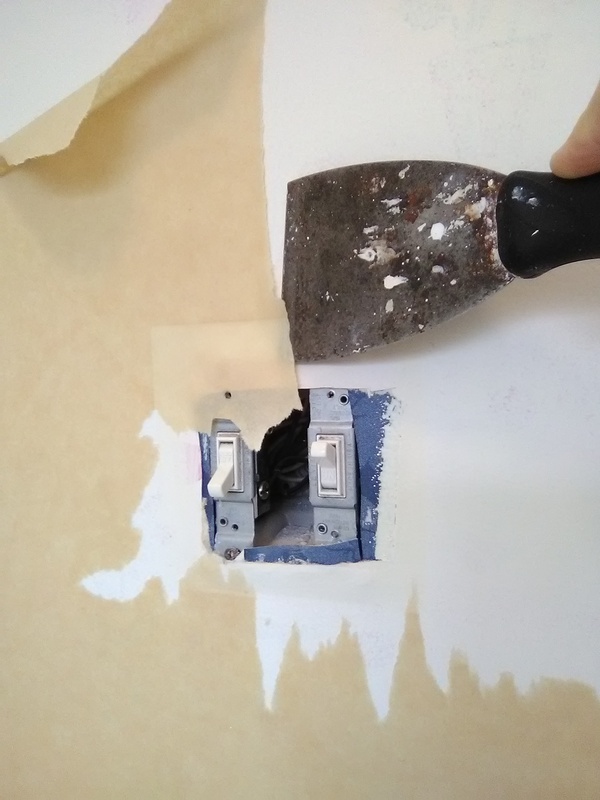 The proper way to strip off wallpaper is to wet it, then separate the top, inked layer from the bottom, substrate layer, and pull the top layer gently off the wall. Then you take a sponge and bucket of water and wet the backing. Once that water reactivates the paste, the paper backing will come away from the wall easily and with little-to-no damage to the wall. 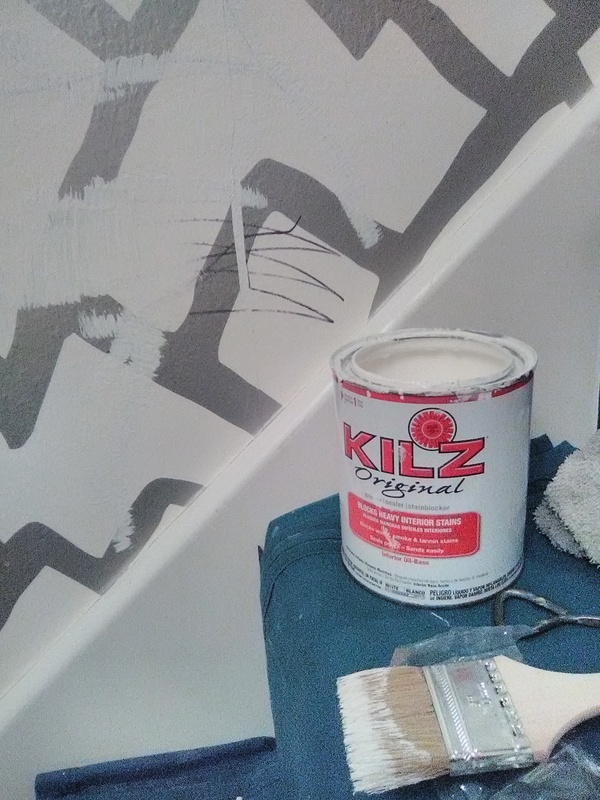 I also suspect that this paper was hung over KILZ Original oil-based primer, which was a superb primer because it stuck tight and because it was not affected or reactivated by the water used to soak the wallpaper backing. Unfortunately, the formula for that product changed due to EPA regulations, and wallpaper paste will no longer stick to it. 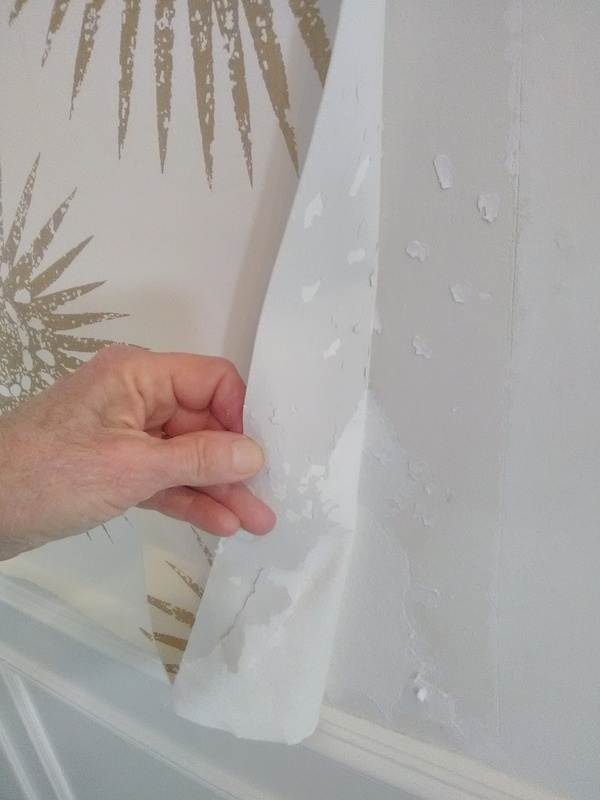 These days, I’m using two alternative primers – both water-based, and I am curious to see how they hold up when wallpaper is stripped off them. 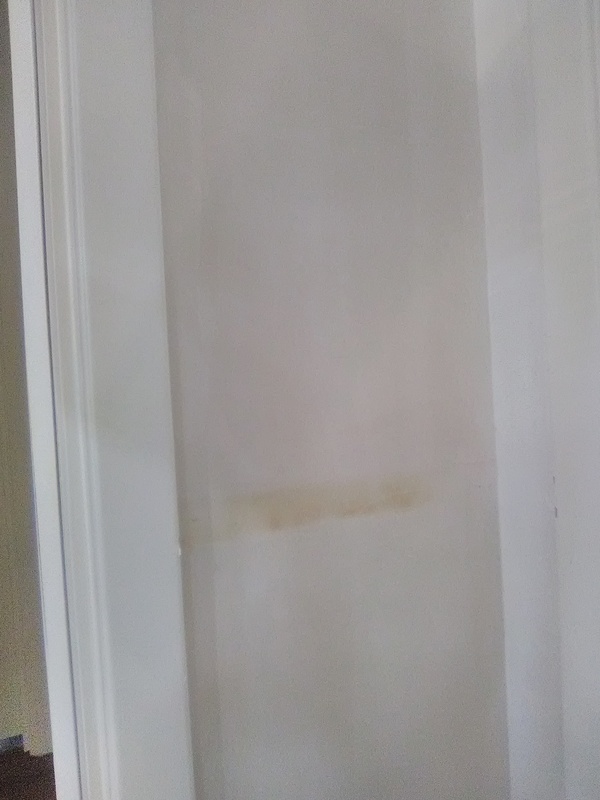 Back to today’s job … Once I got the paper off, I used joint compound (“mud”) to smooth over the uneven areas between the contractor’s stripping job and mine, then sanded smooth, wiped free of dust, primed, and then hung the new paper. The wallpaper pattern is by Thibaut, and is called Bahia. It’s a non-woven product, and is designed to strip off the wall easily and in one piece when it’s time to redecorate. As you can see, neither the contractor nor I had success with that. The tried and true separate-the-layers-and-saturate-the-backing-with-water method was the solution. 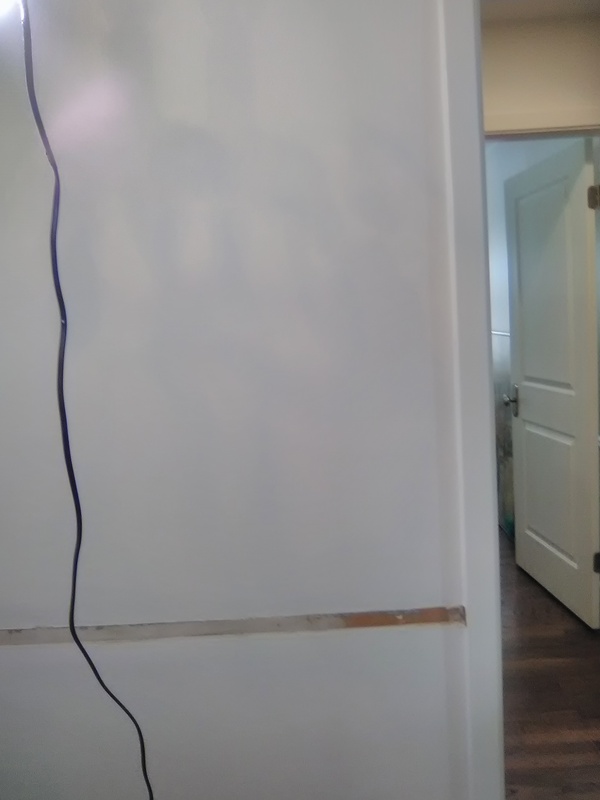 I skim-floated the wall and sanded smooth. It looked great. But brown coloring from the torn Sheetrock had worked its way through the smoothing compound (second photo). Torn drywall is not something that I would normally worry about bleeding through wallpaper (you are concerned mostly with things like grease, ink, water, tobacco, rust, and the like), but this stuff was 60 years old, so who knows what its properties and characteristics were back then? And besides, it had already worked its way through a layer of joint compound – in just one night! No sense in taking the chance that it might bleed through this nearly-white grasscloth natural fiber wallpaper. 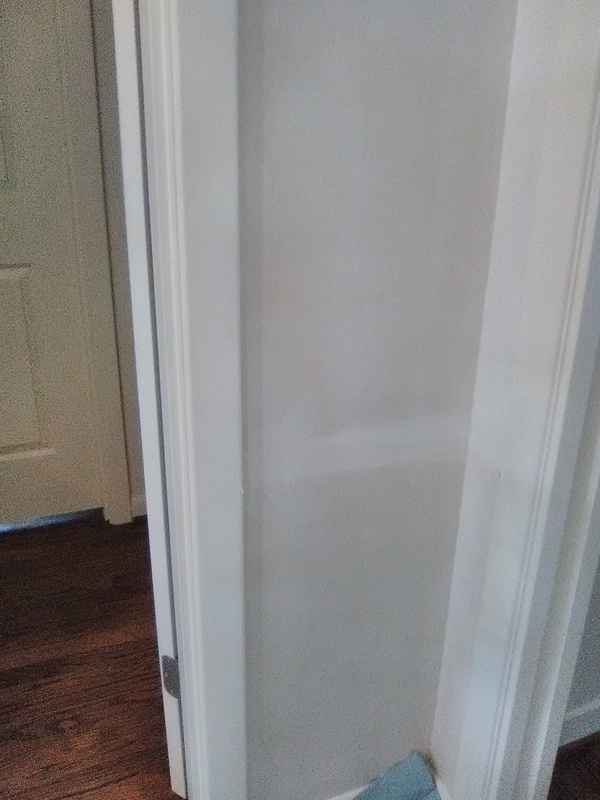 The Gardz penetrating primer / sealer (not pictured) I planned to use on the wall would be fine to hang wallpaper on, but could not guarantee that that brown stain would not work its way through the primer and through the wallpaper. 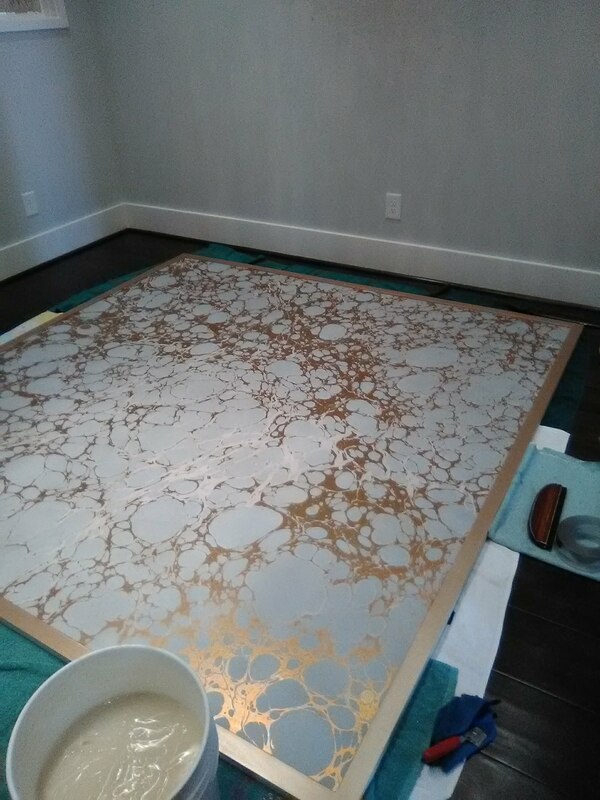 I applied the Gardz, because it’s a great penetrating substance that seals new smoothing compound, and also provides a good surface for hanging wallpaper on. Once that was dry, I followed that with a coat of KILZ Original, an excellent oil-base stain-blocker. 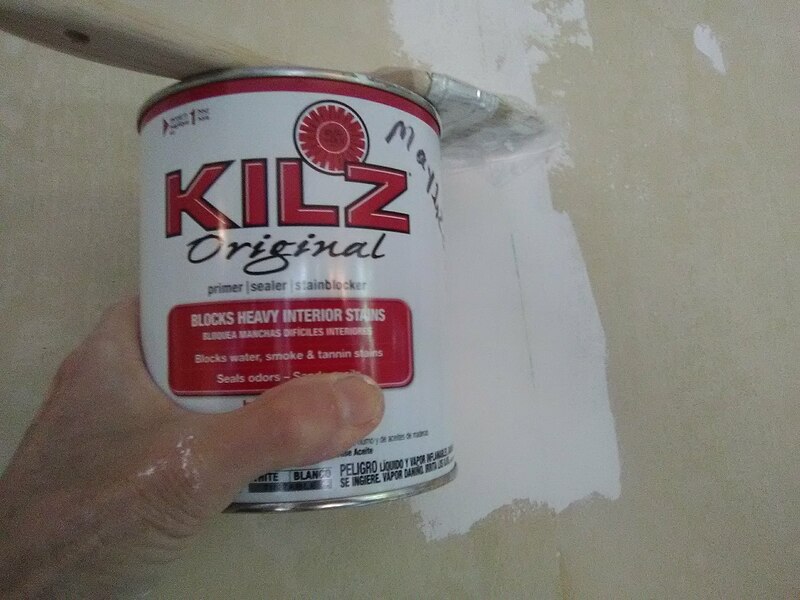 But wallpaper paste will not stick to the new KILZ formula (required in order to comply with current EPA requirements. A little 3″ width around the lower center of the room with wallpaper not sticking tightly to it probably would not be problematic. But you never know, and I didn’t want a “hula hoop” of delaminated wallpaper circling the room. 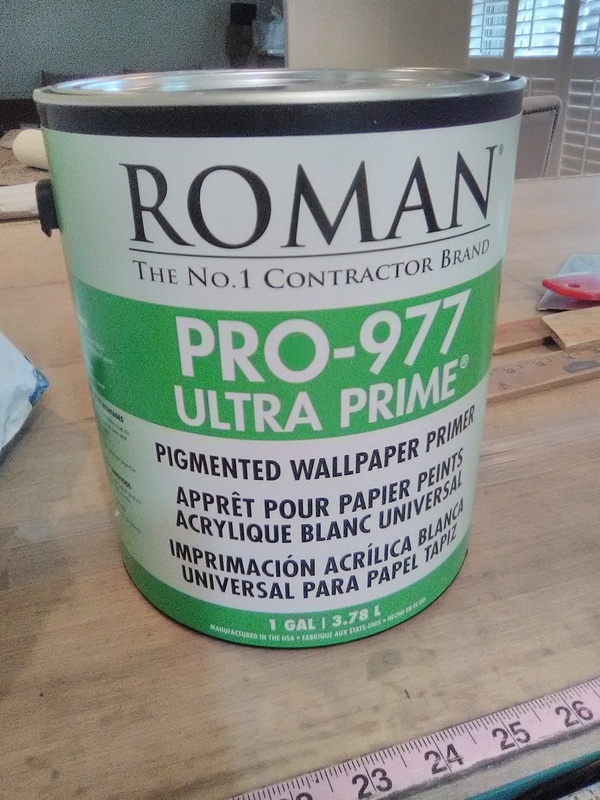 So once the KILZ was dry, I followed up with a coat of a wallpaper-specific primer, Romans Ultra Prime Pro 977. Now the room is ready for wallpaper, without fear of a band of tan bleeding through the new surface. Don’t Let Your Toddler Handle a Sharpie! 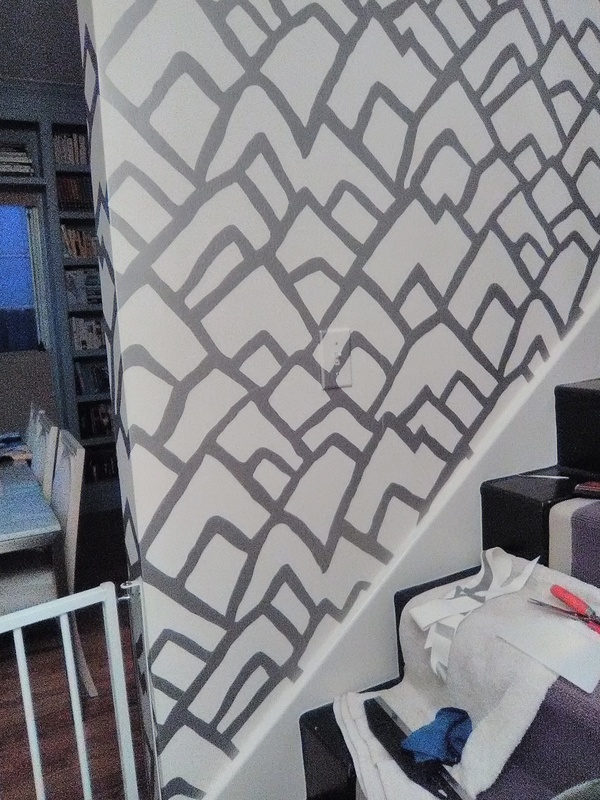 So the little girl was innocently playing with an ink Sharpie, and, well, the wall along the bottom of the stairway just happened to get marked up. (Unfortunately, my “before’ photo got lost somewhere.) This is very expensive wallpaper, and, unfortunately, was the first thing you see when you enter this West University home. I was there to hang paper in the nearby powder room. But every time I walked past this stairwell, the ink marks just kept bothering me. So, with the homeowners’ go-ahead, I decided to fix it. First, we checked to be sure there was enough left-over wallpaper. Thank goodness for boxes stashed in the garage apartment! I didn’t want to strip off the original wallpaper, for fear of scoring the wall and causing seams to lift. So the original wallpaper was left intact. Then the ink had to be covered with a stain blocker, to prevent them from bleeding through the new wallpaper. I used oil-based KILZ Original. Two coats. Next, because wallpaper paste will no longer stick to oil-based products, (due to EPA-required changes to the formulas), I primed the whole area with Gardz. 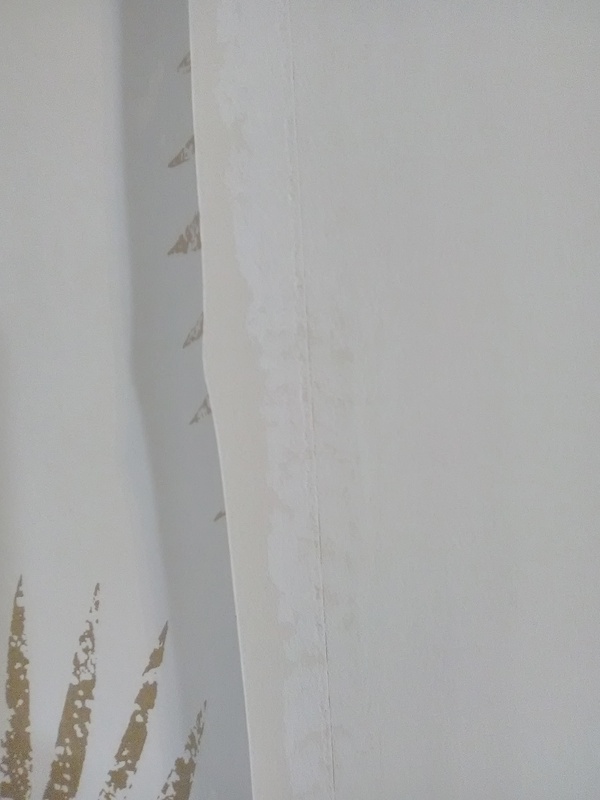 Because it’s not a good idea to have a seam fall on top of a seam, at this time, I placed a strip of seam tape (special stuff made by a colleague of mine) so that it bridged the gap between the two seams of the original wallpaper. The Gardz sealer / primer melded everything together. 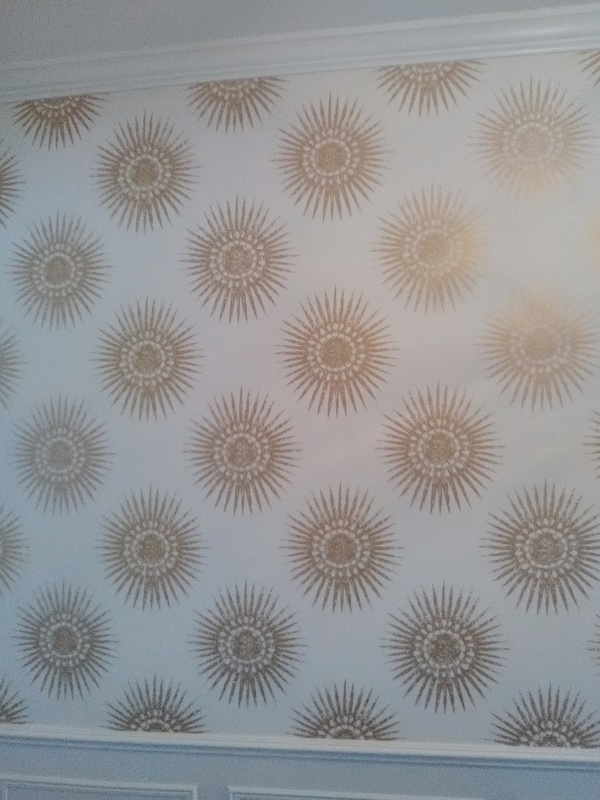 Then I took the left-over wallpaper and found the corresponding pattern to match the pattern on the wall. I used a scissors to cut around this design. 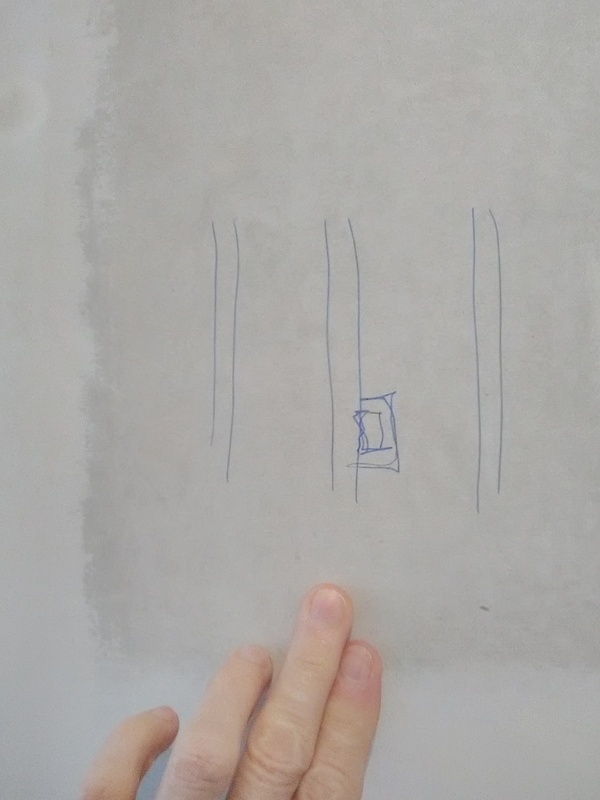 Because this repair fell on a seam, it required two strips of paper, one on either side of the seam. Then I pasted the wallpaper patches, allowed to book and sit, then appliquéd them to the wall. I was surprised at how stretchy and wrinkly the wet wallpaper was. I was glad that I was only doing two 18” high patches – I felt sorry for the guy who had hung a whole 2-story staircase and hallway of this stuff. Bottom line – the finished patch looked fantastic. You could not tell that there had been any errant marks on the wall. Originally, the walls in this West U. living room were smooth and painted. I didn’t notice anything or any stains when I started priming the walls. But almost immediately after the wallpaper primer was applied, I saw some brown stains work their way through the primer. The wall paint must have sealed them adequately, or perhaps I just had not noticed them, but something about the wallpaper primer activated the stains and brought them to the surface. A large, old (antique) piece of wooden furniture had sat against this wall, and probably leaned against it. I figure the stains are from either wood sap (yes, even after decades) or from oily furniture polish that came into contact with the wall. Either way, these stains could work their way through the new wallpaper, just as they had worked their way through the primer. They needed to be sealed with a stain blocker. Many people use a shellac-based stain blocker, like BIN by Zinsser. 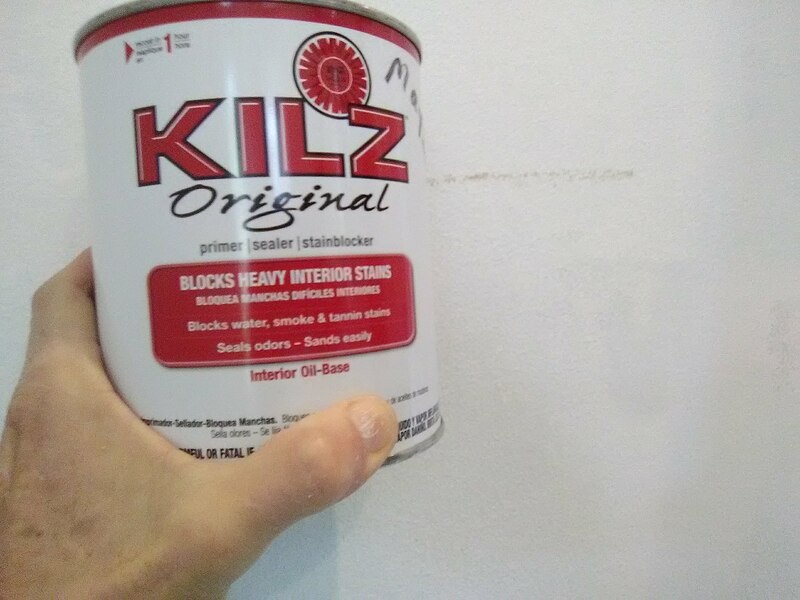 But I like KILZ Original, the oil-based version (not the newer water-borne). Once I applied the KILZ to the stains, they did not reappear. Now I am good to go to get the paper up! I put this paper up back in the ’90’s. It’ still in perfect shape! The two girls who shared this bathroom have grown up and moved away. Mom thought it was time to get rid of the girlhood décor and move to something more suited for a guest bathroom. 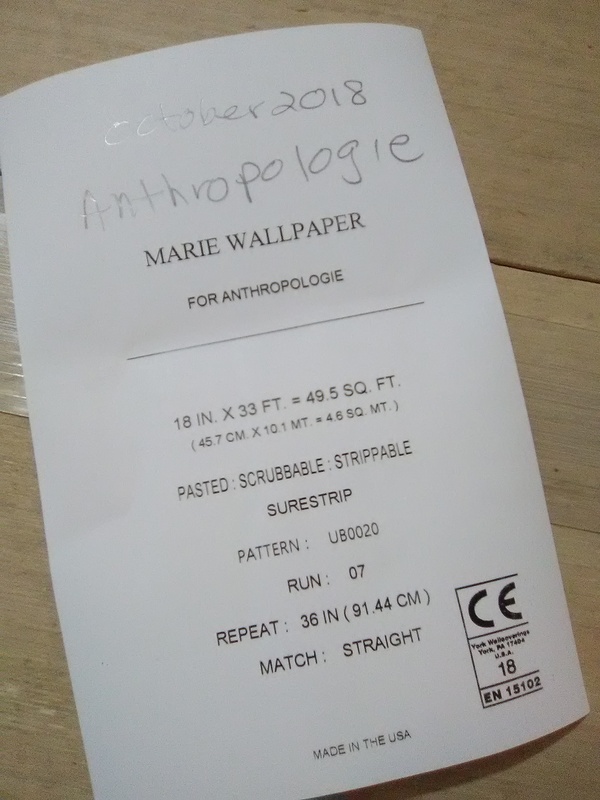 Back to the wallpaper … This pattern is from Anthropologie. It is made by York, and is in their SureStrip line – one of my favorite papers to work with. It is pre-pasted and water-activated. 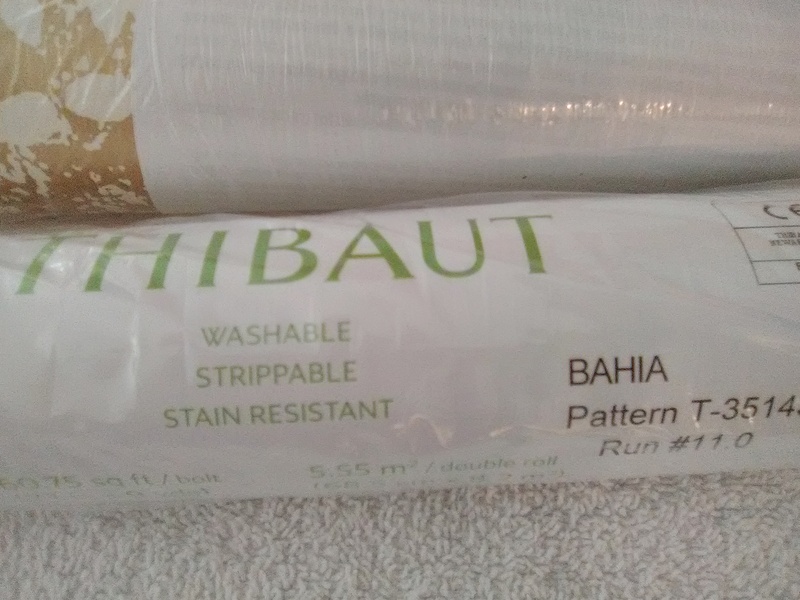 The non-woven substrate is thin and pliable (unlike most other brands), conforms nicely to the walls, and exhibits no shrinkage / gaps at the seams when it dries. The home is in the West University neighborhood of Houston. 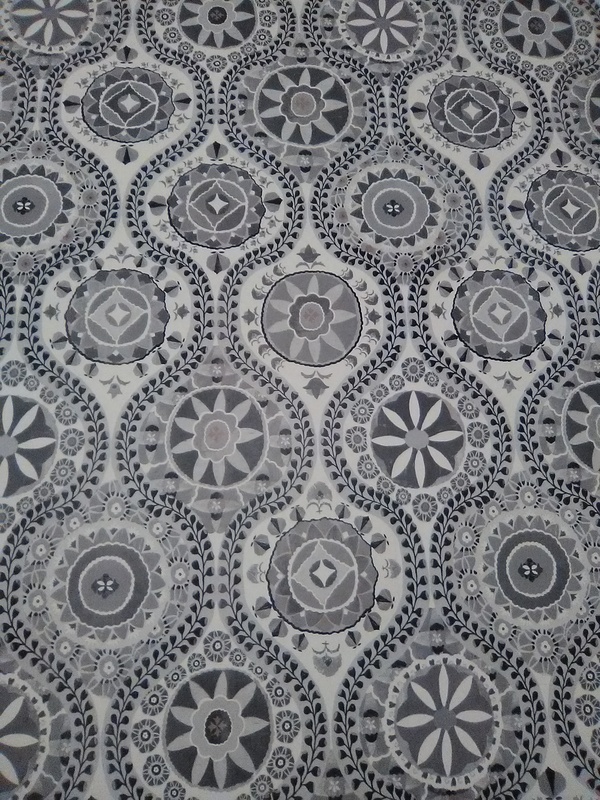 Here’s some really cool, custom-made wallpaper that, expectedly, costs a ton. The homeowners wanted to accentuate two rooms (dining room, master bedroom) with these patterns, but, considering the investment, wanted to be able to take it with them, should they move. After much deliberation and investigation of backings, weight, sturdiness, etc., it was decided to mount each mural on plywood, wrap each of those with a wooden frame, and then mount them on the walls with brackets that attach invisibly to the back. The largest one, which already has its frame attached, and which you see in the top photo, measures about 7′ x 7′, and weights 80 pounds. Imagine getting that thing up two flights of stairs! The top photo shows the large mural finished. It consists of two panels spliced in the middle. It was trimmed in place to fit inside the good frame you see around it. The second photo shows the smaller mural being laid out. It will be applied to the board you seeing lying on the floor in the third photo. 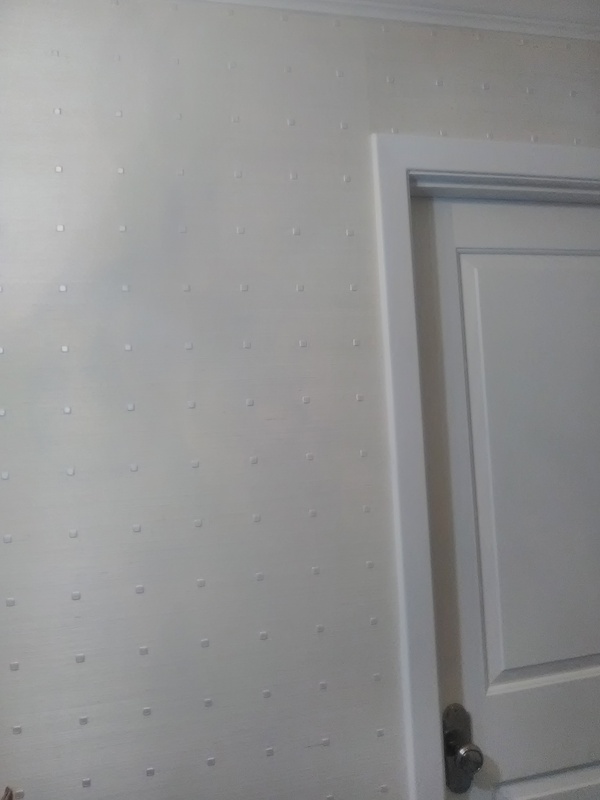 The plywood board has been sealed with KILZ, to prevent knotholes from bleeding through, sanded smooth, and then primed with a wallpaper-specific primer. I used Roman’s Pro 977 Ultra Prime. 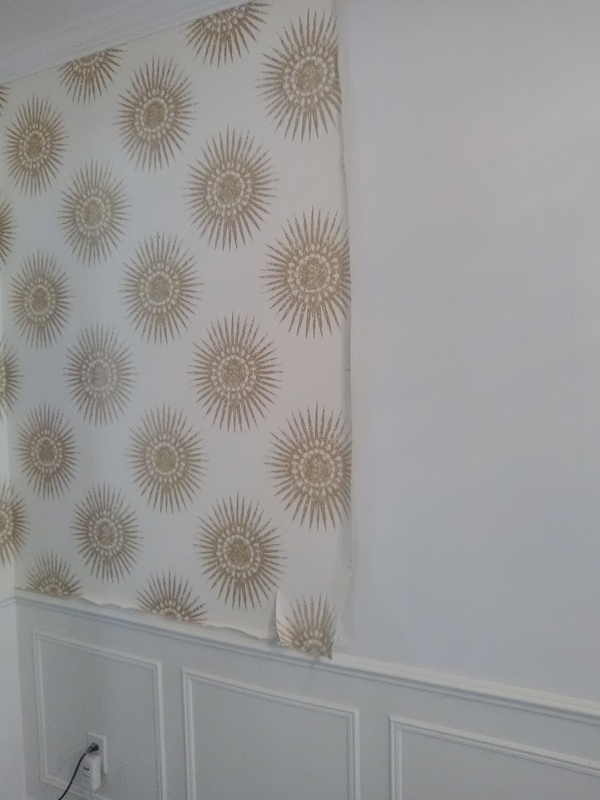 These wallpaper panels are custom-made to fit the project’s dimensions, and have a few extra inches “bleed” area on each side to allow for trimming and adjusting for wonky walls. The bordering silver area will be trimmed off, as will an inch or so of the printed area on each side of the mural. On the smaller, dark mural, someone forgot to add an extra inch for the top and bottom, so the mural was centered as perfectly as possible, but a little bit of the white plywood peeked out on both the top and bottom. Don’t worry – a black frame will be constructed to cover the edges of the plywood, and it will have a lip (rabbet) that will cover this teeny gap. 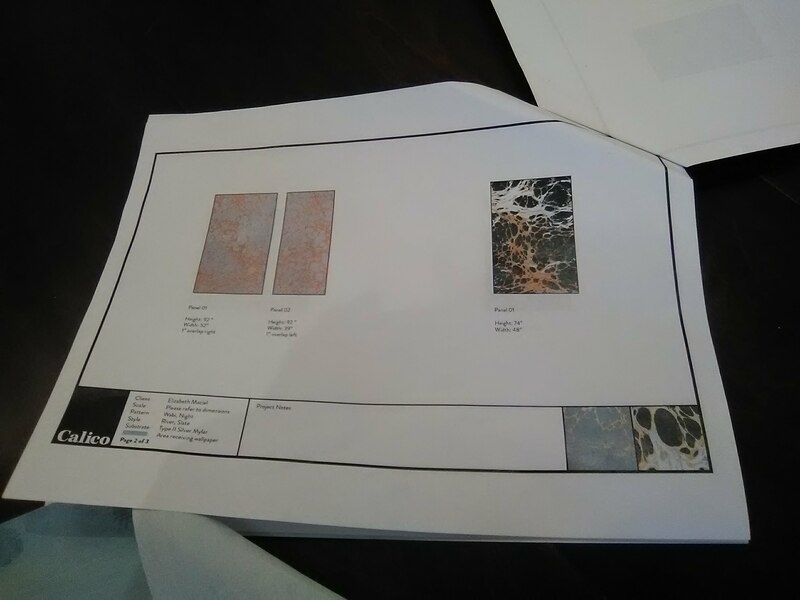 The last photo shows one page of the instruction sheets, which includes drawings from the manufacturer detailing the layout and dimensions of each mural. The large mural came in two panels, which had to be overlapped in the center, carefully matching the pattern, and then double cut, or spliced. Double cutting involves overlapping the edges of the two strips of wallpaper, while carefully matching the pattern. Then you take a straight edge and a brand new, very sharp razor blade and cut through both layers of paper. This paper was very thick, so I had to press really hard to get through both layers in one sweep. You want to avoid making multiple cuts if possible. 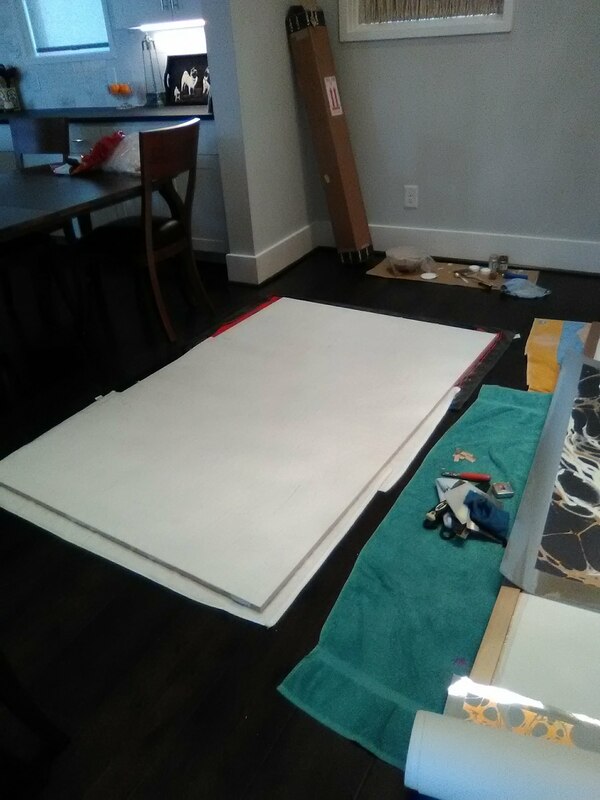 To keep from scoring into the plywood below (and it’s even more important if you are cutting on a wall made of drywall and / or many layers of paint and primer), I put a strip of polystyrene plastic on the plywood surface to keep the razor blade from cutting into the bottom surface. Once the double cut is made, the excess wallpaper, as well as the polystyrene strip, are removed, and the two edges of wallpaper smoothed into place. This makes for a very perfect seam. All this takes a lot of time. It would be really cumbersome in a larger or more complicated room. But protecting the subsurface is important, because, once the wallpaper starts drying, it shrinks a little and pulls taught, and if the surface below is not intact (due to a cut from a razor blade, or from something else like dust on the surface or layers of incompatible materials such as old oil based paint covered with latex paint), these layers can come apart (delaminate), and the wallpaper seams will pull apart. This is not the paper “coming loose,” and it cannot be “glued back.” It is actually layers of the wall delaminating. The material was a thick non-woven on a mylar plastic, and was very thick and somewhat difficult to work with. In addition, the panels were much wider than normal wallpaper, and hard for me to manipulate. I was glad that the interior designer was hanging around and was game for helping me position these pieces. As I said, the material was thick and stiff, and no matter how hard I pushed or what extreme tool I used (metal plate), it would not press tightly into the corners of the gold frame enough for me to get a satisfactory cut – meaning that there was a slight (1/16″ – 1/8″ gap between the material and the frame. 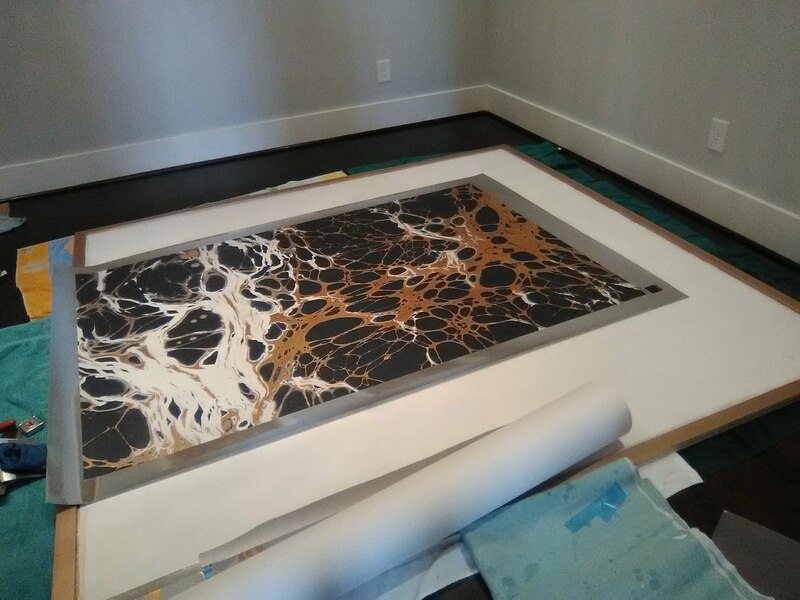 No matter… The interior designer was easy going, and said she will add a small piece of molding to the inside of the gold frame, to cover any gap, as well as to prevent the thick material from curling up. On the smaller, dark mural, the black frame to be constructed will include a lip (rabbet) that will cover the open edge and help hold it down, as well as cover the outside edge of the plywood panel. 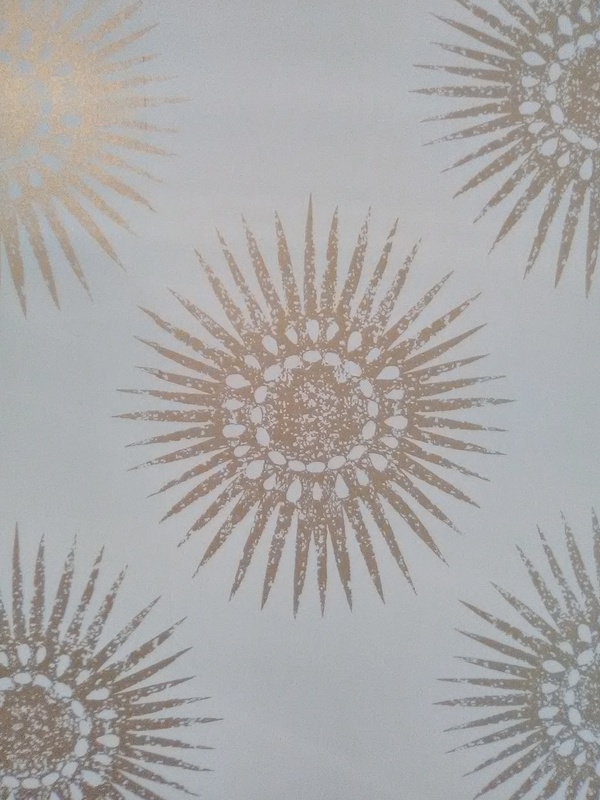 This gutsy wallpaper is made by Calico, a husband-and-wife team out of New York City that is just a few years old – not many people have this stuff – and even fewer have the balls to put it on their walls! The interior designer for the project is Elizabeth Maciel, and the location is a newish home in the Montrose neighborhood of Houston. When the old wallpaper was pulled off, surprises were revealed! 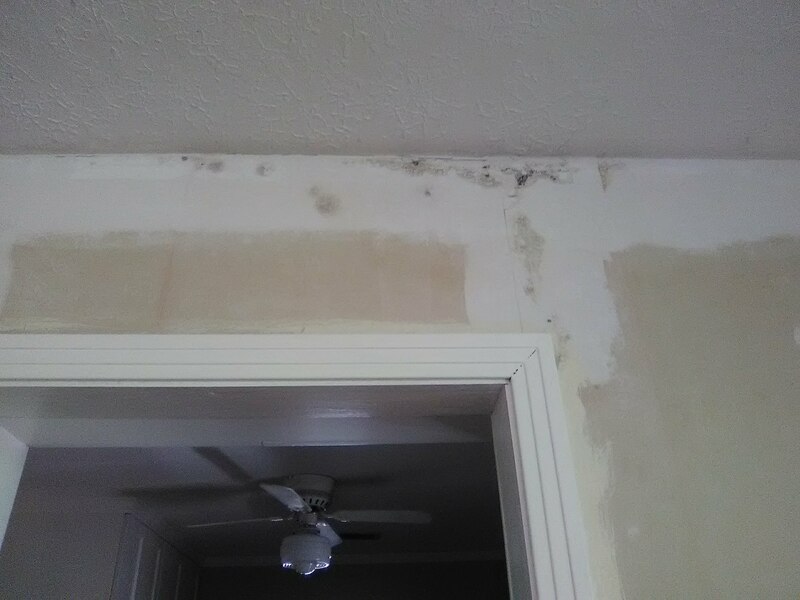 Here you see mildew (don’t worry, it’s not mold) that had grown under the paper where a water leak had lead to damp conditions, probably exacerbated by the thick, non-breathing, vinyl wallpaper. 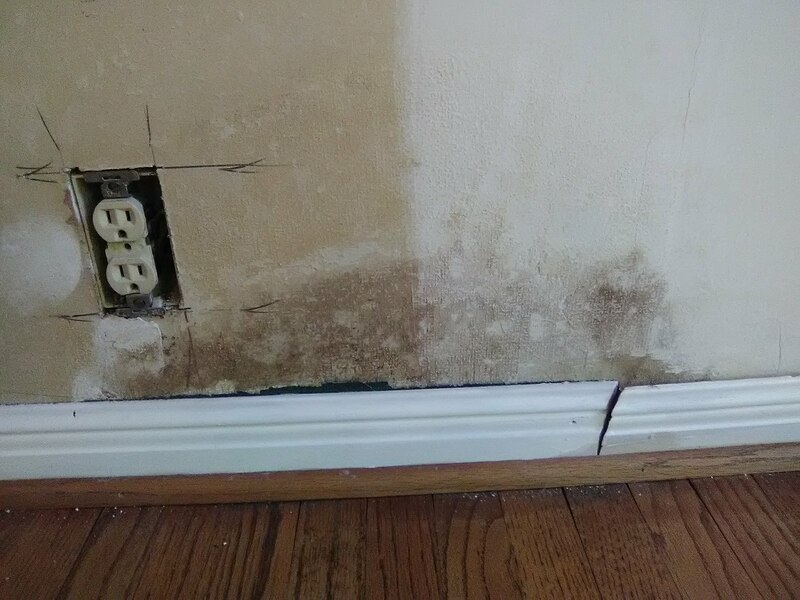 Mildew will bleed through wallpaper, and it can also create a powdery colony that will not provide a stable surface for the wallpaper to grab ahold of. To kill the mildew, I washed it with full-strength bleach. When that was dry, I went over it with an oil-based stain blocker. 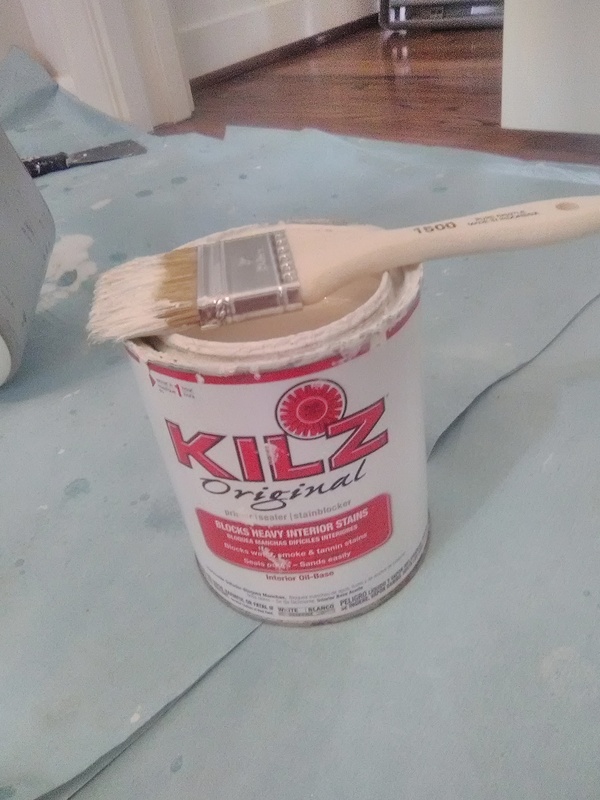 I like the product KILZ Original.